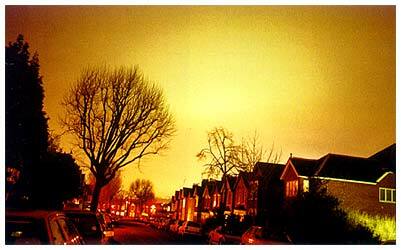 Sky glow occurs from both natural and human-made sources. The natural component of sky glow has five sources: sunlight reflected off the moon and earth, faint air glow in the upper atmosphere (a permanent, low-grade aurora), sunlight reflected off interplanetary dust (zodiacal light), starlight scattered in the atmosphere, and background light from faint, unresolved stars and nebulae (celestial objects or diffuse masses of interstellar dust and gas that appear as hazy smudges of light). Natural sky glow is well quantified. In this publication, further discussion of sky glow considers only human-made sources. Electric lighting also increases night sky brightness and is the human-made source of sky glow. Light that is either emitted directly upward by luminaires or reflected from the ground is scattered by dust and gas molecules in the atmosphere, producing a luminous background. It has the effect of reducing one’s ability to view the stars, as seen in Figure 3. Sky glow is highly variable depending on immediate weather conditions, quantity of dust and gas in the atmosphere, amount of light directed skyward, and the direction from which it is viewed. In poor weather conditions, more particles are present in the atmosphere to scatter the upward-bound light, so sky glow becomes a very visible effect of wasted light and wasted energy. Sky glow is of most concern to astronomers because it reduces their ability to view celestial objects. Sky glow increases the brightness of the dark areas of the sky, which reduces the contrast of stars or other celestial objects against the dark sky background. Astronomers typically like very dry clear dark nights for observing. A typical suburban sky is 5 to 10 times brighter at the zenith than the natural sky (the zenith is the angle that points directly upward, or 180°, from the observation point). In city centers, the zenith may be 25 or 50 times brighter than the natural background. Sky brightness is increasing, as recorded by professional and amateur astronomers. For example, at the Mars Hill Observatory in Flagstaff, Arizona, sky brightness is reported to have increased by 0.5 magnitude from 1976 to 1988 (Lockwood et al. 1990). An increase in brightness at this level means that certain stars may blend into the background, making them indistinguishable. Upgren (1991) performed naked eye observations of bright stars over the interval from 1977–1991. Upgren’s data show an increase in light pollution and possibly air pollution in the area around Middletown, Connecticut.